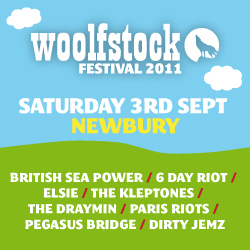 We’re hoping for a little more of that sun and less of the welly on Saturday 3rd September, as we’re delighted to announce one last UK festival show for us at Woolfstock, a smart 2,000 capacity one-dayer just outside Newbury. To tempt you further, you’ll be getting a bigger dose of the K-Sound than any other festival this summer bar Glastonbury, as not only will we be playing a 90 minute AV set to close the Main Stage (following the most excellent British Sea Power and 6 Day Riot), Eric will then be legging it over to the Dance tent for a 90 minute DJ set. So that’s a solid three hours of K-Power in one day! It’s really going to be an ace end to our European summer, partying in a seriously gorgeous location with some great friends, quality food and drink, and it’s not much more than an hour’s drive from London (and yes, you can camp! ), so you really should come along, and spread the word to everyone you reckon will be up for it – it will be worthwhile!